HALIFAX -- A Nova Scotia aboriginal band is drafting ambitious plans to rebuild a community on the site of a Mi'kmaq village that was obliterated by the Halifax Explosion nearly a century ago. Black-and-white photos taken at the turn of the last century show a collection of wigwams close to the shoreline at the narrowest part of Halifax harbour. The Mi'kmaq called it Turtle Grove. Some of the descendants of those who lived there, members of the Millbrook First Nation, want to develop the site to include a mix of residential and commercial properties. The band, which is no stranger to commercial success, has tentative plans to build a boardwalk, marina, ferry terminal and residential units with office and retail space, some of which would be made available to band members. About 900 members live on the existing reserve in the Truro area, an hour's drive north of Halifax. Another 900 live off the reserve, many of them in the Halifax area. "That would be reserve land (and) that would create a desire (for band members) to be there," says chief Bob Gloade. "We're also looking at some cultural components and marking the history of the residents ... There could be a monument." At least six families were living at Turtle Grove in December 1917 when a Belgian relief ship and a French vessel carrying munitions collided only a few hundred metres from the village, Gloade says. 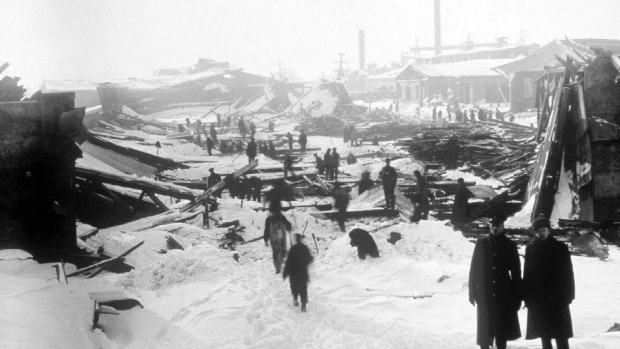 The resulting blast and tidal wave razed Turtle Grove, killing many of its residents and almost 2,000 others in the surrounding area, making it the worst disaster in Canadian history. To this day, a section of what was once Turtle Grove remains empty. The small tree-lined cove sits idle and overgrown in the shadow of a large, gas-fired generating station known as Tuft's Cove. The humble site will soon be declared reserve land as part of an outstanding Mi'kmaq claim - though Gloade says there's a problem. "The biggest hurdle that we're running into is firming up how much land we can develop so we can plan it out properly." The 3.9-hectare site is stretched so thinly along the shoreline that it would be impossible to develop properly, he says. The band wants to buy more land, but that could take a long time. The site is adjacent to Shannon Park, a 33-hectare former military community built by the Department of National Defence after the Second World War. Abandoned by 2003, it includes more than 400 empty apartment units, a store, two schools, two churches, an arena, swimming pool and community centre. In March 2014, the Canada Lands Company -- the federal government's real estate arm -- bought 33 hectares of Shannon Park for $4 million. The Crown corporation presented three development proposals to the public last November and a preferred concept is expected to be submitted for municipal approval this spring. Demolition at the site started earlier this month. The Millbrook band is a partner with the contractor, Dexter Construction. Gloade says talks with Canada Lands are moving slowly. "There's been an interest and a willingness to work with us up until recently and there's kind of a delay and a lack of working relationship with them," he said. Chris Millier, Canada Lands' director of real estate, said the federal agency has been working with the band since the project started. "We consider them an extremely important stakeholder," he said in an interview. "Millbrook is a sovereign entity. Canada Lands would never suppose to tell them what they can and can't do with their property." As for the band's desire to enlarge its footprint, Millier says the agency won't be in a position to talk about that until the Shannon Park project has received planning and design approvals. "We don't envision lands being made available to the market much before 2018 or 2019," he said.